I founded Tocqueville Asset Management in 1985, with what turned out to be incredibly good timing. Since then, the S&P 500 index of the US stock market has risen from 210 to almost 2,200 — a more than ten-fold appreciation in just over 30 years. Admittedly that rise was punctuated by some scary episodes. Nevertheless it resulted in an annual compound rate of nearly 8%. If we include dividends, as is the recommended practice, the compound, annual “total return” from stocks over the period was in excess of 10% per annum. One factor in that performance was a steady decline of interest rates, which boosted stock prices along with bond prices. According to Bill Gross of Janus Capital, the price of investment-grade US bonds produced an average compound rate of return of 7.47% since 1976. As we see in the graph above, the steady decline of interest rates in the last 30-plus years was preceded by an equally long period of rising interest rates, which peaked at 15% in the early 1980s. But who remembers that? Not most baby boomers. Investors who started their careers in the early 1980s, when interest rates began their long descent, would be approaching retirement today. For younger ones, what preceded is history and does not shape reflexes and behavior in the same way as direct experience. In that respect, at least, I am fortunate to have started working on Wall Street in 1969. Many of the portfolios I analyzed back then contained long-term bonds purchased after World War II at very low yields. By 1969, many were selling for around 50 cents on the dollar and were mostly useful for generating tax losses to offset the capital gains on our stock portfolios. I never forgot that, and it did shape my reflexes and behavior for the long term. Given today’s ultra-low interest rates, Bill Gross estimates that yields would have to drop to minus 17% in order for the bond market to match its return of the last 40 years! There does not seem to be much chance of this happening. 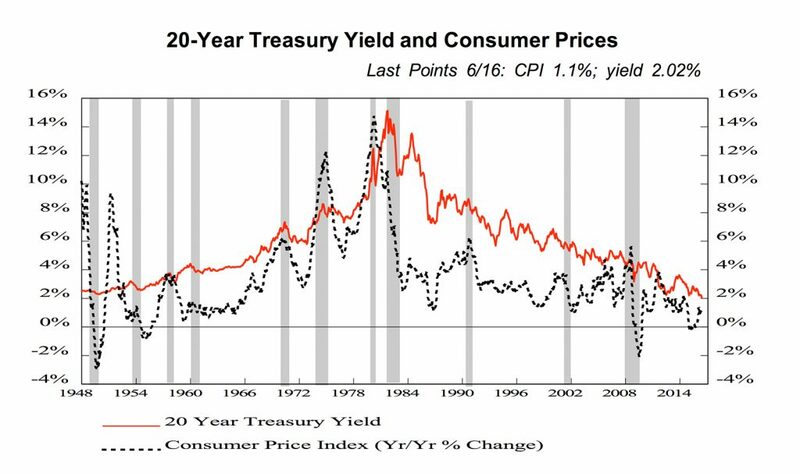 Perhaps instead we should brace ourselves for the mirror image of the recent era of declining rates. Lower interest rates make borrowing cheaper and easier. In the early stages of an economic cycle, this dynamic will normally stimulate a recovery by providing incentive to spend and invest. However in the long uneven recovery from the 2007-2009 recession the US Federal Reserve (followed later by other major central banks) resorted to more desperate measures. These included zero interest rates policies (ZIRP), quantitative easing, and negative interest rates – policies which are collectively known as financial repression. After years of interest rates being artificially repressed, the behavior of economic agents has altered: we increasingly act as if interest rates would remain low forever. In short, a new complacency about the current abnormal state of affairs has set in. The first, dramatic consequences of “preventive” easy money were observed as early as 2007 in the private banking sector, with the bursting of the sub-prime lending bubble and its catastrophic results. But more recently, the stubbornness of central banks in repressing interest rates seem to be creating a bubble the world’s bond markets. So far, investors are merely enjoying the ride, thinking they are coping well with a difficult environment. But painless excesses seldom come to a painless resolution. I believe that a majority of investors is ready to acknowledge such a scenario in theory but that as consumers, businesspeople and taxpayers, few are prepared to adapt to such a change if it becomes reality. 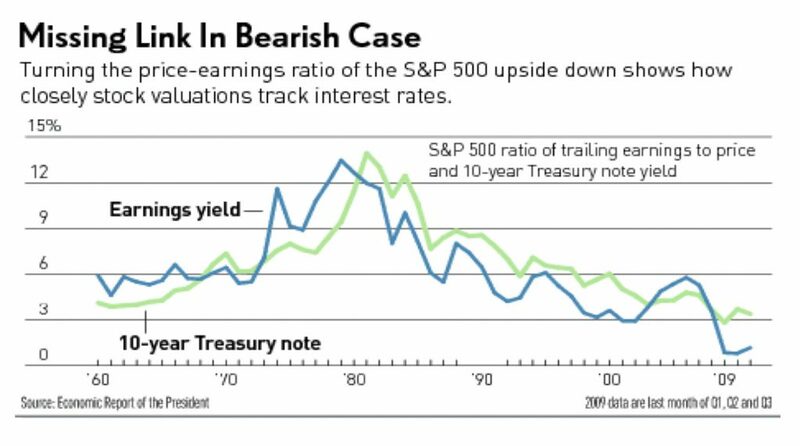 The tendency of stock valuations (Price/Earnings, or P/E, ratios) to rise when interest rates go down has been well documented and makes intuitive sense. Stocks compete with bills and bonds for investors’ money and when interest rates earned on bills and bonds decline, the relative attractiveness of stocks improves, raising P/E ratios. Corporate profits, while cyclical, tend to grow rather steadily over the years. The main difference between major bull and bear markets really comes from changes in P/E ratios. As can be seen below, P/E ratios have been the main force at the back of the major bull market of the last 30-plus years. With today’s interest rates in major markets hovering around zero, it is not surprising that, depending on the index used, global P/E ratios are somewhere between above-average and very expensive historically. Without making specific predictions, it is prudent to be prepared for a normalization of interest rates someday. If lower interest rates boost the price of bonds, stocks (P/E ratios), real estate, art and (as a result of the so-called “wealth effect”) our propensity to spend, what do we think will happen when they rise again? The reduced income available from bonds and other fixed income instruments is changing investors’ attitudes. There are indications that many, deprived by the low interest rate environment of their traditional income-producing investments, are assuming increased risk – sometimes to foolish levels – to try and improve their total returns. The anguish of retirees who depend on fixed-income portfolios to meet their living expenses is readily understandable. But this phenomenon also affects the beneficiaries of many older pension funds, whose employers are still assuming that the future overall return on their pension portfolio will be 7% per annum. In fact, the income on the bond portion of these portfolios should trend closer to zero as maturing, older bonds, are replaced by lower-yielding new ones. Meanwhile, a number of models predict that stocks in general cannot exceed a 5-6% total return annually over the next 10 years, given today’s extended valuations. So it is very likely that the actuarial assumptions underlying many pension plans are unrealistic and that the companies or state entities that sponsored them will have to fund their pension obligations from their own pockets (or, more likely, from those of their shareholders or taxpayers). There will always be gullible people ready to invest blindly in a “story.” In recent years some global companies have taken advantage of low interest rates to issue record levels of perpetual debt, i.e. debt that never needs to be repaid. Bonds of such companies thus may never return to their issue price. One of my concerns about the near-term future is that many of the excesses we are witnessing seem painless. For example, even though the US government has issued $8 trillion of new debt since the financial crisis, its interest rate costs are lower than before the crisis: as debt has doubled, the rate of interest has halved, helping keep the government budget deficit (and our taxes) in check. So far: no pain, all relief. In the private sector, more debt can be undertaken on houses at historically low rates so that the monthly interest payments on mortgages are painlessly low. But debt is debt and someday, the principal of the loan will become due. In many other areas, current incomes are similarly sustained or even enhanced at the expense of deteriorating balance sheets. For example, many companies periodically buy back blocks of their own shares to support stock prices. They thus also increase reported earnings per share by reducing the number of shares outstanding. On the balance sheet, however, this strategy reduces the company’s cash and, importantly, the shareholders’ equity. Some companies are taking further advantage of suppressed interest rates by actually borrowing to repurchase their shares in the market, thus boosting stock prices (instant pleasure) at the expense of their balance sheets (future pain). On the whole, the current environment can be better described as one of self-satisfied complacency than as one of irrational exuberance. With very few alternatives to generate positive returns, many investors choose to remain fully invested in stocks. While US statistics indicate outflows from equity mutual funds and ETFs, there are indications that the money is not actually leaving the stock market. Instead it is being invested in the large companies that drive the performance of major capitalization-weighted indexes. It’s a sneaky form of indexing under the guise of “active management,” but a practice that props up both the major stock market indexes and the already-extended valuation of their major components. In spite of the cautionary tone of this first investment letter, we are neither timorous investors nor “perma-bears.” We actually keep a thick and growing file tracking all the reasons to be optimistic about the future. But in keeping with our commitment to think and invest as contrarian value investors, this file will only be opened when we sense that the investing crowd has become irrationally pessimistic. Today, we see it more as overly complacent. So, what to do? Traditionally, value investors like us have tended to follow a “bottom-up” rather than a “top-down” approach. We don’t focus on analyzing the macroeconomic outlook or devising stock market strategies. Rather we concentrate on valuing individual companies and comparing our estimations to these companies’ stock prices. In the past, both logic and experience have vindicated that approach: It was fine to remain fully invested at all times because value stocks, often underpriced to start with, generally withstood price corrections better than the overall market. But the recent 2007-9 financial crisis and recession demonstrated how global economies and financial markets are now so intertwined that a single event like the collapse of Lehman Brothers in 2008 can threaten the worldwide economic and financial order. This deflationary tornado changed many value investors’ views (including ours) on the subject of bottom-up vs. top-down investing, because all stocks — big and small, growth and value, financially strong and weak –were caught in the whirlpool.